Now the assembly is replaced into the housing and the strip fed into the bottom of the tube. The strip is fed up the base tube until it appears at the end of the inner tube. 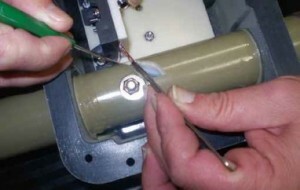 A bullet is then placed onto the strip to guide it past the various joints in the tube. I used the original which was soldered on as the plastic one and superglue did not fit very well. A quick test on the table manually showed that the motor and strip were operating as expected with a small back pressure. The top half of the antenna (fibreglass fishing rod) is now secured and the unit placed upright for testing. Attach the control unit and select calibrate to bring the strip back to its lowest point. It is of course already there so it slips the clutch for about 30 seconds in a most alarming way. Now select a high frequency and the strip should feed up the tube and stop. Replace the radials. Check with your MFJ antenna tuner or a small rf signal and SWR meter and if the SWR is low it appears to be fixed. Try the other bands and replace the cover. So what was the result? UK stations now being received on 40M for the first time. USA heard on most evenings and far too many Spanish locals in-between. The tuning is so good that the Rig noise has also gone down. I also found that the original 40M radial was way out of tune and managed to get a very nice tune using the MFJ. The control unit has a rig interface. When the rig is tuned the interface sends antenna adjustment instructions which moves the antenna strip higher or lower as required. I have removed it as I now believe that the repetitive small back and forth movement of this strip caused the base unit to make the strip jump off the pulley and snap the strip. In practice the retuning is hardly required and can be adjusted manually. It also removes the terrible RF noise when the antenna is retuning. Still missing 80 metres but that’s another story !